Genus: Pseudophoenix H.Wendl. ex Sarg. This species is accepted, and its native range is Dominican Republic (Barahona Peninsula, Island Beata). 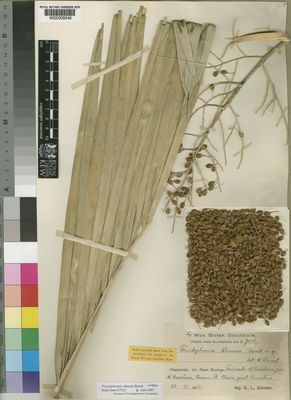 Although virtually the entire population of Pseudophoenix ekmanii occurs in a national park, the palm is still harvested for its sweet sap which is fermented into alcohol. Decapitated juveniles attest to the activities of sap poachers. In addition, seed harvesting, if excessive, may threaten the reproductive health of the population. Pseudophoenix ekmanii occurs at low elevations in the Parque Nacional Jaragua and Isla Beata. The vegetation in classified by Hager and Zanoni (1993) as Barahona Peninsula Dry Forest, and the substrate is limestone with little or no overlying soil. The region receives 630–800 mm of precipitation per year and has a distinct dry season from December to May (Hager & Zanoni 1993). Stem 5–6 m tall, strongly ventricose, most slender above the swelling, ca. 60 cm dbh, with prominent brown leaf scars and waxy white internodes when young, gray when mature. Leaves ca. 12 in the crown, spreading (mature) or ascending (juvenile); leaf ca. 2–3 m long; sheath ca. 35 cm long, green with silvery gray scales near the apex; petiole absent; rachis ca. 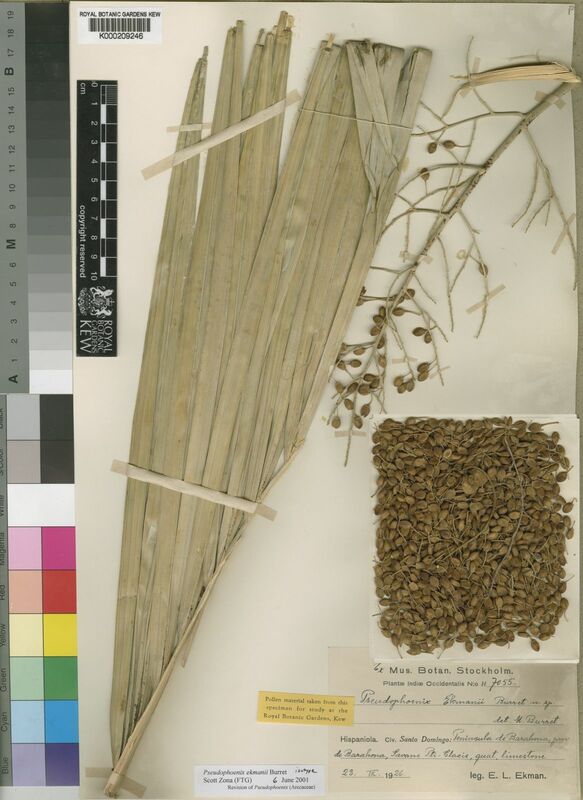 161 cm long, often with brown scales along its margin; number of leaf segments per one side of the rachis not known; middle leaf segment 31.0–39.5 cm long, 1.7–2.3 cm wide, lanceolate with an acuminate tip, gray-green, densely glaucous on both sides, ramenta present on the abaxial surface of the midvein at the base of the leaf segment. Inflorescence erect, ascending or arching, branched to 3 orders, ca. 154 cm long; peduncle not extending far beyond the leaf sheaths, glabrous; prophyll not seen; inner bract not seen; rachillae 5.9–8.0 cm long and 0.8–0.9 mm diam., divaricating. Flower pseudopedicel 7.2–7.6 mm long, 0.4–0.5 mm diam., green to glaucous; calyx a shallow triangular cupule, 3.5–3.8 mm diam., green to glaucous, margins hyaline; petals ovate, ca. 7.0 mm long and 3.7 mm wide, green, glaucous abaxially, spreading, with ca. 13 major veins; filaments 1.3–1.7 mm long, briefly connate, anthers ovoid, ca. 2.8 mm long, ca. 1.5 mm wide, yellow; gynoecium and pistillode not seen. Fruit 11.8–14.3 mm long, 11.7–13.2 mm diam. (in single-seeded fruits); endocarp 11.7–13.2 mm long, 11.1–12.6 mm diam., ca. 0.2 mm thick. Seed 6.8–7.1 mm long, 8.5–9.4 mm diam.